Happy Memorial Day Weekend Everyone! I'm headed to the lake this weekend for a nice detox and I can't wait. I always love going to the lake especially when work starts to become a little too stressful. I'll be working hard this summer to rebrand and finalize some things that I have in store for Feline By Katsaris, so stay tuned. 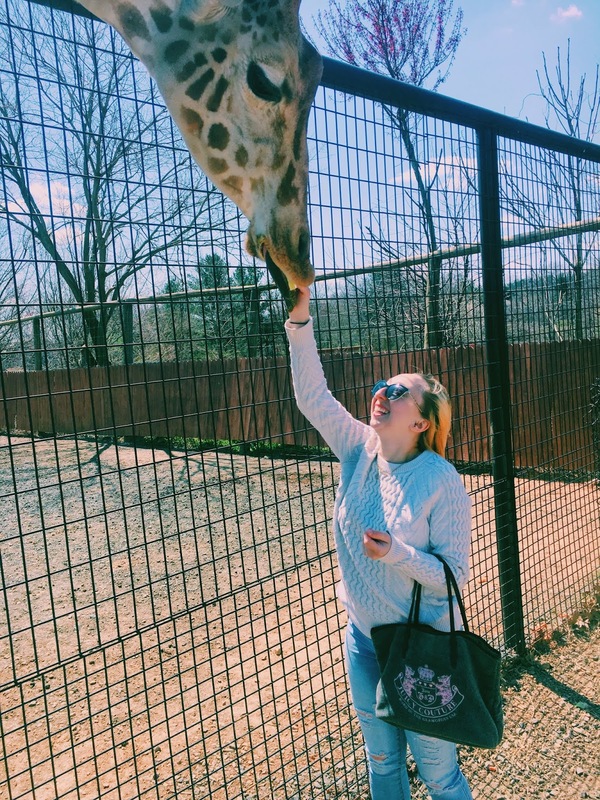 In the mean time enjoy this awesome pictures of me and Waffles the giraffe from the Reston Zoo and another round of Links I Love. LMDC TOUR // LEA MICHELE IS GOING ON TOUR! I literally screamed when this got announced. I have been waiting for her to go on tour and my friend Krysta and I got VIP tickets. That’s right, in less than two weeks I will be meeting my freaking idol!!!!! This Shirt // Since I won Caps tickets last week, Omar and I felt that it was okay to spend money on NHL gear since the tickets were free. I have been wearing this shirt basically everday since. It’s extremely comfortable and yet it’s light weight. Plus, it’s super cute! Avengers Read Mean Tweets // I always love these videos, but since we just saw Avengers this one was just too perfect. Try to watch this without crying of laughter. Dream Machine Exhibit // I’m just speechless…. This place looks magical. Plus, they’re totally right, it’s an Instagrammer’s dream. Cheesetique // Omar surprised me for our 4 year anniversary by taking me to a restaurant based around cheese. Cheese is my favorite food and I was beyond excited to eat my way through this menu. It's as awesome and mouth watering as it sounds! Demi Lovato Documentary // I’ve never been a Demi fan to be honest, but after watching this I have a new found respect and appreciation for her. Her songs Tell Me You Love Me and Don’t Do It For Me Anymore are just hauntingly beautiful. Kylie Cosmetics Collabs // Kourtney is hands down my favorite of the Kardashians and her Kylie Cosmetics collar is just as cheeky and chic as she is. However, Kris Jenner takes the win on all of these collaborations, because her marketing and packaging for this product was perfect! Get $10 off your first order now!